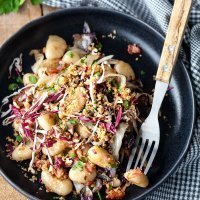 This Pan-fried Gnocchi with Radicchio and Bacon is a hearty winter comfort food dish, ready in just 15 minutes. It’s been a while, but we have not been idle during this time. We have many great recipes coming up on the blog in the upcoming days and weeks! Actually, is anyone ready for spring? I can just feel it in the air! Just this past Sunday I’ve glimpsed the first of the snowdrops, meaning Spring is just around the corner! I am so excited and ready for this winter to be over! 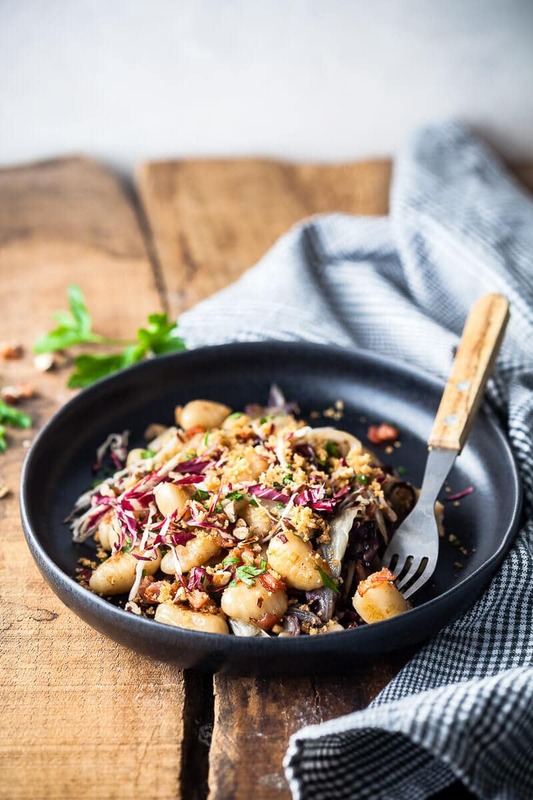 But, while we are waiting for the first of the fresh spring produce, the dandelions, wild garlic, and the asparagus, we’ll be sharing some more winter themed recipes, like this Pan-fried Gnocchi with Radicchio. 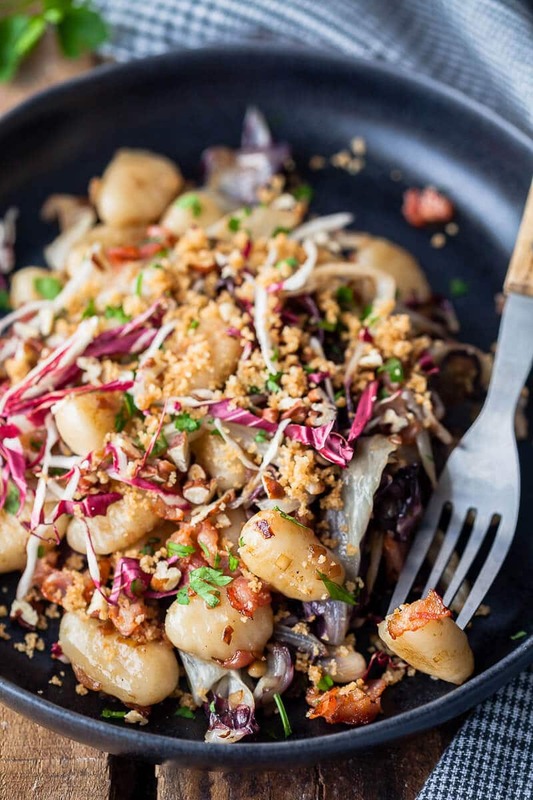 This Pan-fried Gnocchi with Radicchio is a simple and easy winter meal to make on a low-key day. Sometimes we all have days when we do not want to cook. 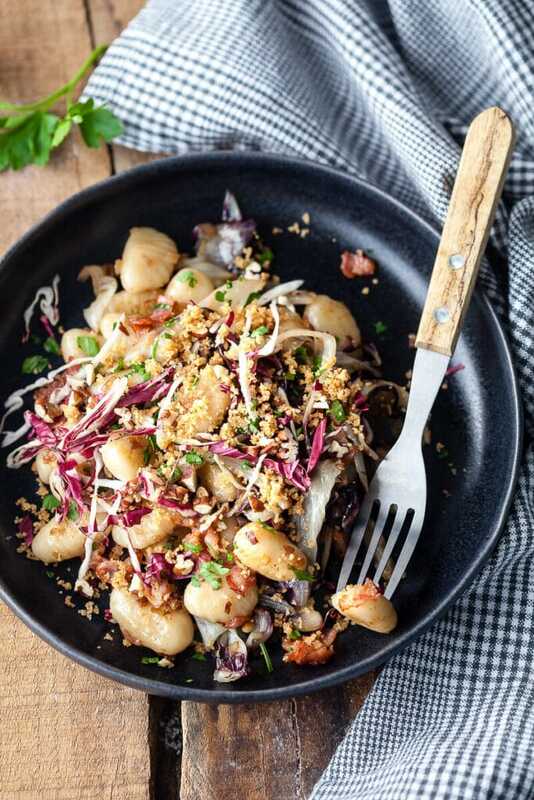 So to make this gnocchi dish, just start with some bacon, onions, and radicchio, add in some pre-cooked store-bought gnocchi and you’re almost done! 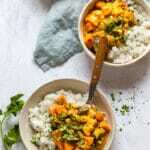 Just 4 main ingredients and a few extras and you have a pretty delicious meal in just 15 minutes. 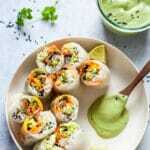 This dish is dairy-free, but you can easily make it vegan by just skipping the bacon in the recipe. Prepare the vegetables: peel and finely chop onion and garlic. Wash and dry radicchio leaves, then chop into slices. In a pan heat a tablespoon of oil or vegan butter and add breadcrumbs. Gently fry while stirring regularly, until the breadcrumbs turn crispy and golden brown. Remove from pan and set aside. To the same pan add chopped pecan nuts and dry roast for a minute or two, until they warm up. Remove from pan and set aside. 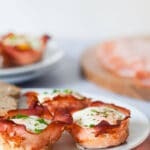 Add bacon to the pan and fry until crispy, then remove from the pan and set aside on a plate lined with a paper towel to drain. Leave the bacon grease in the pan and add finely chopped onions. Stir-fry until translucent, then add finely chopped garlic and chopped radicchio. Bring a pot of salted water to a boil and cook gnocchi according to package instructions, about a minute or two. As soon as they float to the surface, remove them from the pot with a strainer and place them into the pan to the radicchio. Let the gnocchi fry for a minute until golden-brown, carefully stirring them to ensure an even roast. Add a spoon of vegan butter and season with salt and pepper to taste. 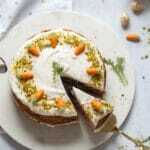 Serve with finely chopped parsley, roasted breadcrumbs and pecan nuts. Aditionally, you can sprinkle some grated parmesan (or dairy-free alternative) on top and add some raw sliced radicchio. 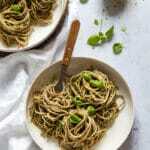 You can make this dish VEGAN by skipping the bacon, and use vegan alternatives to butter and parmesan.